Our community is always foremost in our mind when we at The Center create resources, tools and events. With a focus on the connection between design and health, we, with our partners, create, launch and deliver programs that provide true value to the healthcare design industry — The Pebble Project, EDAC certification, the Affiliate Program, the HERD Journal, the Healthcare Design and Environments for Aging Expo & Conferences, ICONS and Innovators webinar series, along with the largest collection of healthcare design research, best practices, resources and tools for today’s most urgent and challenging healthcare design issues. February 14, Webinar: Post-Acute Environments – What’s Wrong With Them? Hopefully, you find all of the resources in this newsletter interesting and helpful. Be sure to share them with your team and as always, let me know what tools and resources are helpful to you and we'll feature them in our future newsletters. “Physician, heal thyself.” Facing increased errors, inadequate patient care, and high turnover rates, healthcare facilities are heeding this age-old advice with initiatives to improve the well-being of their doctors, nurses, and administration staff. Most healthcare organizations already have wellness programs in place that target employees’ physical health. They address the most basic needs of physiological safety, comfort, and fitness via infection control, ergonomics, natural light, healthy food, and exercise. Cincinnati Business Courier, more . . . In today’s healthcare environment, patients have many options. Whether it’s time spent in the waiting room—or to schedule a return visit—time is a critical factor. Therefore, in order to remain competitive while still delivering premium services, building owners are looking for ways to better design their medical facilities for expediency of care. Three top design features to consider when designing for speed of service for patients are 1) wearable devices, 2) flexible layouts and 3) wayfinding. Mobile/transportable medical units have been used for many years throughout the United States to provide temporary access to medical and dental services, diagnostic imaging and other nonemergency services. However, in recent years there has been an increase in the acuity level of patients being served in these units, and the medical services provided have become more complicated and more invasive. In fact, these services are often the same as those offered in permanent structures, but are being provided in spaces without the same oversight and regulation. Join Us Tomorrow - Let us Help You Prepare for the EDAC Exam with an Online EDAC Exam Study Session! This interview explores the driving forces that prompted Kaiser Permanente to reimagine and transform ambulatory care delivery. 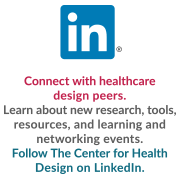 Come meet and connect with The Center's Affiliate members and the regional healthcare design community for "Innovations in Healthcare Design" - an informal, creative presentation, (worth one EDAC/AIA CEU credit), with wine, hors d’oeuvres and networking. Come see the projects The Center's EDAC Advocate Firms have been working on for the past 10 years, including the project's goals, the challenges faced along with the solutions developed.